H-Pattern V-Bar style chains. Excellent life and grip for winter conditions. Made specially for small tractor applications. I purchased the H-pattern V-bar for rear tires (26 -12-12 R4 Industrial tires).Chains appear to be of good quality and delivery was prompt. Fit was good and traction was much improved. When I ordered these chains I thought that they were quite expensive but once they arrived I could see the quality of the chains. I realize now that the chains are quite a good value. very happy with my purchase. 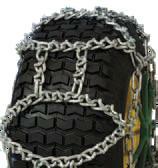 I have used the chains three times this winter. 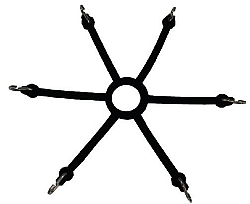 The chains stay in position on the tires, give a smooth ride and don't lose their grip. Over all very pleased with the chains supplied. The online order was very easy, the chains arrived quickly, the fit is good and they work very well. I would suggest replacing the clevis's used to hold the "H" rails in place with Quick links. The clevis pins keep coming out. The only complaint I have is the delivery company. I supplied my home address but received a call from the delivery man saying he wanted to know where he wanted me to leave the chains as he wasn't going to drop them at my house!